I was a college teacher for most of my life. When my fourth baby arrived, I gave up a travel-heavy university job and took a “mommy job” as a bookstore manager. I chose books, held teacher workshops, and read stories to children for 15 years. As the internet became important, we put up a website and I became the manager of that site. 18 months later, the bookstore’s owners went bankrupt and closed the store. My initial reaction was, “They can’t do that – we’re #2 on Google!” We’d also gone from zero ecommerce sales to $5,000 a month. We had visitors to our blog from 192 different countries. Online, we were a success. But it was 2008, and lots of small businesses were going under. Lots of people were unemployed. I was unemployed for the first time in my life. Being #2 or even #1 on Google had a different meaning in those days, before customized search results. For me, it meant that I had become skilled with SEO and content marketing, but I figured I’d have to return to the classroom when my job ended. I scoffed bitterly. I had kids in college and two more getting ready to finish high school. I clearly needed a higher level of security than self-employment could offer. What’s more, I had already discovered that people who found out what I did with computers invariably looked at me oddly and said, “You don’t look like a computer guy.” They were right, although we now have a much more open minded idea of what computer guys can look like. Back then, though, I looked like someone’s mom. I was someone’s mom. This caused a high level of cognitive dissonance for some people, I knew. But I was bold enough to do a little bit of helping other businesses while I looked for work. I wrote an essay at the site that was then SEOMoz and got a job offer in the comments. I picked up a couple of local clients, and then through an online marketplace found some international clients. I went to job interviews, of course, and was offered jobs managing various things. But nothing I was offered was as fun as the work I was doing online. I turned down all the offers I received. She was dressed as a witch. The hallways were full of cotton spider webs and spooky decorations. She was taking me down to the basement to meet the Web People. I was the only one who laughed. You see the humor, right? They did not. I realized that I didn’t really want to go back to academia, I didn’t want to manage things, and I didn’t want to sit in a cubicle proofreading. I wanted to have fun with websites. At that point, I reviewed my income figures, saw that I was earning twice as much as I had earned as a bookstore manager, and decided that I would carry on as an independent Web Person. As a freelance web writer and SEO, I never met a CMS I couldn’t make friends with. If there wasn’t a CMS at a website, I used Dreamweaver. Drupal, Joomla, Mango, sticks and clay tablets, I didn’t care. I used WordPress along with all the other options my clients wanted. In 2009, after being featured in the Wall Street Journal, my freelance business boomed. I teamed up with designers and built websites in addition to writing for web designers and agencies and businesses on four continents. But with Rosie as my partner, I was able to build a thriving business. In 2010 we built a WordPress site for K-12 teachers just in time for our first WordCamp. We needed a lab site, and I had just finished writing a bunch of lesson plans with the Kennedy Center for the Performing Arts. In the course of that project I had discovered how limited online STEM (science, tech, engineering, and math) options for K-12 teachers were. We built a website called FreshPlans to help fill that need and had a functioning WordPress site for WordCamp. I didn’t have a good answer for why we weren’t doing it, but we went ahead and switched our business site to WordPress. We convinced our designer to give WordPress a chance and built WordPress websites for clients who needed new sites. We saw how much more sense the websites made to our clients. We saw how much more quickly we could build the sites and how much more value we could provide for our clients without the cost of bringing in a developer. We found that we were able to streamline our process for the clients whose blogging and social media we look after. We saw impressive results for our clients, too; not every website can go from 0 to 8,000 visits in six months, but we definitely see better results with WordPress than without it. Within a year, we went from platform agnostic to a dedicated WordPress shop. It worked better for us. It worked better for the people whose sites we built and managed. We were also beginning to see the value of open source and to appreciate the WordPress community. After that first WordCamp, I spoke at a couple of camps every year and our company sponsors and helps organize a couple of WordCamps nearly every year. Last year I spoke at three and I hope to continue expanding that service. WordPress has been good to us and we want to give back to the awesome WordPress community. Our business has grown. My eldest son graduated from college and joined the family business. My second daughter left us to work for Automattic. We’ve had some rough times, as every business does, but we can be proud of the work we do. We have the privilege of working with awesome clients, both locally and around the world. They can share their brands and their bigger messages in ways that would have been difficult and costly just a decade ago. We’re able to get great results for them – with hard work and WordPress. WordPress is not a magic pixie dust you can sprinkle on your website for instant success. It may not be true (okay, it isn’t true) that you can master WordPress with no tech skills, training, or effort. But you don’t have to be a programmer to get the results you want and need in WordPress. If you have something to say, you can get it published more easily in WordPress than with other platforms. There’s no quality tradeoff. We usually build custom websites with talented and trained designers, but I’ve built dozens myself with pre-made themes and my own HTML and CSS skills (and great photos – the secret weapon for non-artists who want to create beautiful WordPress websites). Either way, you’re not limited by WordPress as you are by drag-and-drop sitebuilding tools. Because updating and adding content is so easy with WordPress, you can accomplish the essentials of content marketing more easily. You can focus on your message with less worry about the medium. You and your Web People can shape the web experience you want for your visitors efficiently. WordPress has the most supportive community you can find. We’re friends with local companies that we could also call competitors, because we spend time together in Meetups and WordCamp organizing meetings. We also have a large network of WordPress folks we respect and admire. It’s great to see them in person at WordCamps, but we also have the opportunity to get to know them better virtually. We help them and they help us. I can say from experience that WordPress has made a big difference in my life. I’m still a mom – in fact, I’m now a grandmother. But I’m also the owner of a successful web firm and a successful educational website. I write for and care for a number of websites I can be proud of. Last year at WordCamp Kansas City a man came up to show me his new website. I had spoken the year before about how to get started with a WordPress website, and he had been able to build a site for his fantasy hockey league. He was excited to show it to me, and I was excited to see it. That capacity to help other people achieve their goals with WordPress means a lot to me. If you’re just starting with WordPress, let my story encourage you. 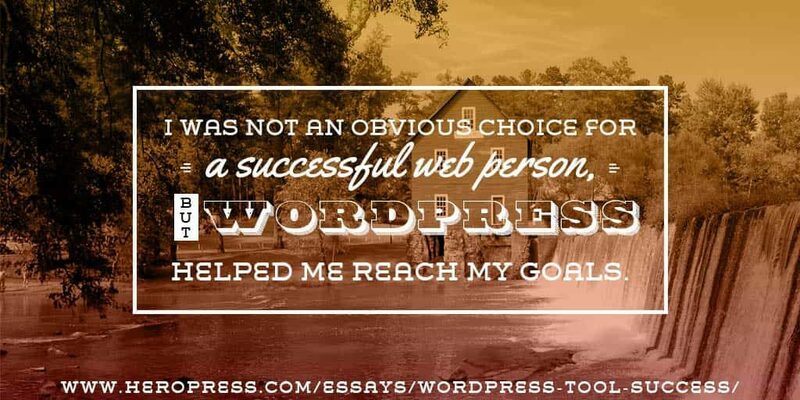 I was not an obvious choice for a successful Web Person, but WordPress helped me reach my goals. If you’re already a success with WordPress, find opportunities to help others reach their success, too. The post WordPress: A Tool for Success appeared first on HeroPress.